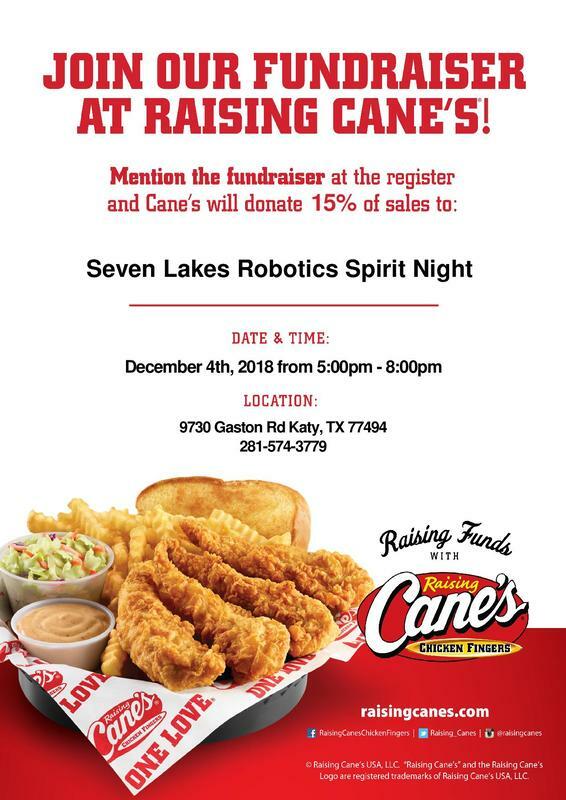 On December 4th, Team 4639 is having a spirit night at the Raising Cane's at 9730 Gaston Rd in Katy, TX from 5:00 - 8:00 pm. All you have to do is mention the fundraiser at the register and Cane's will donate 15% of the sales! For more info, see the flyer below. See you there! On May 2nd, MOD Pizza will be our partner in a fundraiser for the club! All you have to do is show the cashier a printed or digital copy of the flyer to support us. Thank you for your support! All members who signed up for the trip to the Alamo Regional, do not forget that we leave Wednesday, April 4th from Seven Lakes around 5:00 pm. Competion will be held the following days, and we will be arriving back at SLHS late Saturday evening. DO NOT FORGET!!! In one week, the official kick off for the 2018 FRC Season will begin. Please mark January 6, 2018 on your calanders, don’t forget! On December 9th there will picture day, so to speak, for the year book. Save the date! On November 29, the Seven Lakes RoboSpartans will hold a fundraiser with the help of Buffalo Wild Wings! 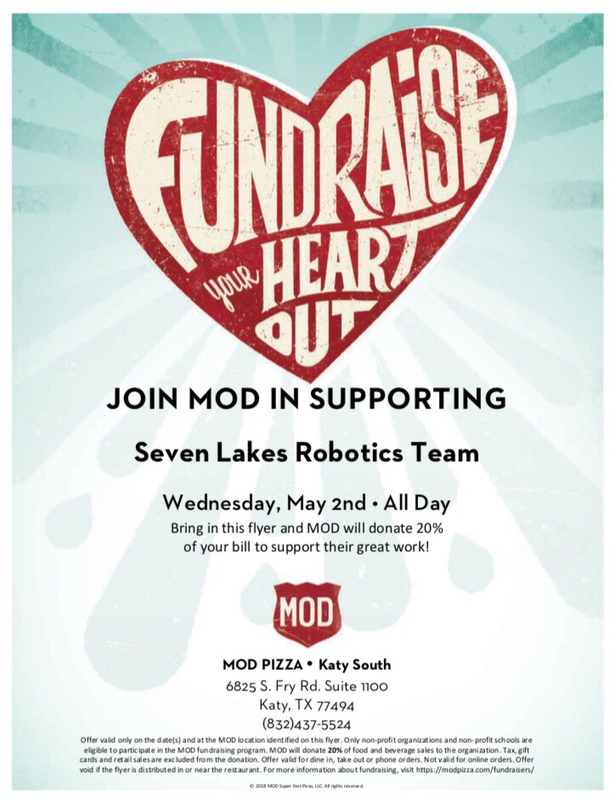 All you have to do is mention "Seven Lakes Robotics" during checkout at the Bella Terra Buffalo Wild Wings location. As a requirement to do many things in our club, all members and volunteers must be safety trained prior to just about all else. The next couple of weeks are the best opportunity to get trained as time is running out! Please get safety training as soon as you possibly can! Thank you. Starting this coming school year, this news site will be used for more important information about events and other things. These posts will include some more details to specific events and other information whereas the blog will be giving a small, brief look into a competition or other small events ( school demos and such ). Please look to checking here and the blog every now and then for updates. On October 17, 2015, the Seven Lakes High School Robotics Club hosted a Girl Scouts Brownie Workshop to help promote science among girls in the community. Over 80 Girl Scout Brownies from local area elementary schools, along with Brownie troop leaders and parent chaperones, gathered at the Robert R. Shaw Center for STEAM (Science, Technology, Engineering, Arts and Mathematics) where the girls performed hands-on experiments necessary to earn the Home Scientist Badge. The girls rotated through five different stations with each station featuring a particular science experiment. Seven Lakes High School Robotics students and parent volunteers led the the activities and explained the science behind each activity. By using ordinary household objects, the girls were able to learn about emulsion, static electricity, density, carbon dioxide, and colloids. The workshop also included a robot demonstration led by the President of the Robotics Club, Alex Millan. The attendees were able to see the robot in action as it maneuvered its way through the 2015 FIRST Robotics Competition Game field, picking up totes and the recycling bin. At the end of the workshop, the girls received the Home Scientist Badge that they had earned. The Seven Lakes Robotics Club would like to thank all of the participants, volunteers, and the Shaw Center for making this event possible. ​​VEX Nothing But Net is a robotic competition in which various high school teams form alliances to compete in matches to have their robotic creations throw balls to score points. Local high schools are gearing up for the first round of the competition which takes place December 5, 2015 in Houston, TX. design. Each team collaborated on their robot’s size, shape, and operating functions. Students will continue to meet to refine their design and subsequently build their robots in preparation for the competition. Ultimately RoboSpartans will have to decide on one robot to represent Seven Lakes High School at the December 5th VEX Competition. Good Luck VEX RoboSpartans! Please see the Remind texts for the latest up to date information.